Norton’s Jace Ruder won the regional punt, pass and kick competition at a Kansas City Chiefs game when he was nine years old. Ruder started playing football in fourth grade and his father and coach, John, put his son at quarterback. John saw his son’s athleticism, along with great hand-eye coordination and intelligence. When Jace was in sixth grade, John, a two-time all-conference wide receiver for Fort Hays State University in 1991 and ’92, saw the potential his son had. John talked with Pat Poore, a Stockton graduate and also a former FHSU all-league player. Poore is the veteran wide receivers coach at University of Minnesota and has relation to John’s wife, Jennifer. Poore provided the contacts for National Football Academies camps, which Jace started between his sixth and seventh grade seasons. Ruder went back-to-back years and refined his delivery through coach Mansur Ivie. It’s that mixture of talent, intelligence and skill set that has made Jace Ruder one of the nation’s top freshman quarterbacks. His dad said Jace’s goals are Division I and eventually the NFL. Multiple Division I schools have the 6-foot-3, 180-pound Ruder on their radar. Last week, Ruder led a 35-6 road victory against Oakley and the Plainsmen’s first-year coach Ty Pfannenstiel. Before this season, Pfannenstiel assisted at Gardner-Edgerton and coached Bubba Starling, who earned a football scholarship to Nebraska and was a Kansas City Royals’ first round draft pick. 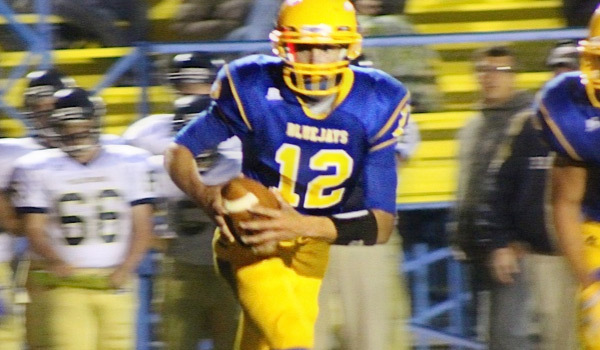 Norton has made 24 state playoff appearances, two off the top-10 in Kansas history, according to preppowerindex.com. But the Bluejays haven’t won a title since 1986 or reached a final since ’89. Under ninth-year coach Lucas Melvin, the Bluejays went 9-4 and reached the semifinals in 2009 and a had great 9-1 squad that lost in the second round of the playoffs to Beloit in 2010. This fall, the Bluejays have started 3-0, outscored opponents 115-13 – and are expected to make a deep run in 3A. Ruder, the second-oldest of four kids, has a close-knit family that known for their high character and faith. The Ruder children have attended Kanakuk Kamps, a well-known Midwest Christian camp. Throughout the process, the Ruders have looked to keep it fun for Jace. Joe White, a former Division I coach and player who started Kanakuk among other ministries, invited Ruder and four other kids to do a Bible study every Sunday night this year. Jace’s older sister, Johnnye, attends Oklahoma State mainly because many people she met at Kanakuk go to OSU. All four siblings are very close, especially Johnnye and Jace, who talk and text often. Asked if thought he was a Division I quarterback, the normally calm Ruder remained humble. “I will let the playing on the football field speak for that,” he said. Ruder, who has dunked a basketball, has completed 21 of 34 passes for 470 yards with a 7/1 TD/INT ratio. His 133 passing efficiency stands second nationally among freshmen, according to maxpreps.com (min. 20 attempts). Ruder took over for junior Jordan Dole, who moved to fullback this fall. The lone interception was one of several drops by Norton wide receivers last week. This week, the Bluejays travel to rival Smith Center (3-0) in what likely will decide the MCL title. Norton has averaged 38 points and 7.4 yards per play, better than the ’09 squad (30.3 points and 6.3). The 2010 team that rolled through the regular season delivered 44.3 points and 8.4 yards per play. “He has got a good arm, and he can throw the ball, but he is still a freshman, and (against Oakley) he made a lot of freshman mistakes, so we have got to fix those,” Melvin, 59-27 as Norton’s coach, said. Ruder has always looked to improve. John and Jace have always played together, but Ruder grew “more serious” in sixth grade. Last spring, the Ruders went to California for personalized instruction with Coach Ivie. In eight hours, Jace threw around 1,200 passes, and did three hours of film study. “It helped him tremendously as far as reading defenses and picking out receivers,” John said. Ivie and Jace still communicate frequently, always about football. John said all his son “thinks about is football.” Jace reviews coverages and plays in his head, even during downtime in school to prepare mentally for games and practices. It’s all part of the years of preparation, work that has made Ruder one of the nation’s best young quarterbacks.